Quantum Thermodynamics is a continuous dialogue between two independent theories: Thermodynamics and Quantum Mechanics. Whenever the two theories have addressed the same phenomena new insight has emerged. We follow the dialogue from equilibrium Quantum Thermodynamics and the notion of entropy and entropy inequalities which are the base of the II-law. Dynamical considerations lead to non-equilibrium thermodynamics of quantum Open Systems. The central part played by completely positive maps is discussed leading to the Gorini–Kossakowski–Lindblad–Sudarshan “GKLS” equation. 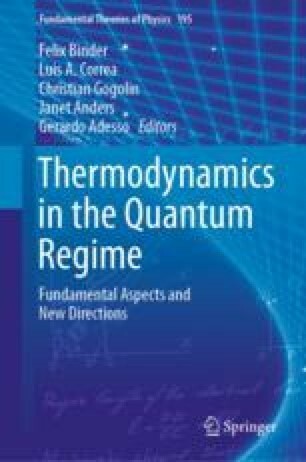 We address the connection to thermodynamics through the system-bath weak-coupling-limit WCL leading to dynamical versions of the I-law. The dialogue has developed through the analysis of quantum engines and refrigerators. Reciprocating and continuous engines are discussed. The autonomous quantum absorption refrigerator is employed to illustrate the III-law. Finally, we describe some open questions and perspectives. We want to thank Amikam Levi and Raam Uzdin for their helpful comments. The work was partially supported by the Israeli Science Foundation: Grant 2244/14.